Monique McHenry begins her Tuesday afternoon cannabis class, held on the fourth floor of the University of Vermont's Waterman Building, with a question. "Let me have a show of hands. Has anyone in here studied plants or taken a plant biology course?" Only a few arms go up. The showing is better when McHenry asks who has studied zoology or animal biology. McHenry, a botanist and researcher, isn't probing her students to see how many of them know how to grow weed. Her hourlong lecture is on the taxonomy and plant morphology of cannabis, and she wants to gauge their familiarity with scientific nomenclature. If any students in the room signed up for PHRM 200: Medical Cannabis thinking it would be a blow-off class on rolling joints and making hash brownies, they were in for a rude awakening. Lectures and reading assignments in this upper-level course in the College of Medicine's Department of Pharmacology routinely incorporate molecular biology, chemistry, physiology and neuroscience. "It's a pretty intense course," says Ben Dahlgren, a graduate student in pharmacology, just before the lecture. "You have to be paying attention, and probably not be under the influence of cannabis during class, to do well." But Medical Cannabis, the first course of its kind taught on an American college campus, is also meant to be accessible to students from a variety of disciplines. Offered for the first time this semester, it covers a broad swath of information related to this complex and controversial psychoactive plant. Topics include cannabis' history, its effects on human physiology, and the politics and economics that govern its legal production as a medicine in nearly half the states in the country. As two differently shaped leaves appear on screens at the front of the lecture hall, McHenry asks her students whether they think Cannabis sativa and Cannabis indica are the same or different species. Both are members of the Cannabaceae family, she points out, and their relatives include another plant used for making intoxicants: Humulus lupulus, aka hops. Sativa and indica have different physical and chemical properties, but they can be crossbred. Turns out, it's a trick question: There is no scientific consensus. The same holds true, McHenry explains, for the many colorfully named strains of cannabis sold in medical and adult-use (i.e., recreational) dispensaries. (The class routinely avoids the word "marijuana" because of the stigmas it carries.) Are Pineapple Kush and White Widow subspecies or cultivars? Again, she says, that taxonomic question is still "up in the air." Such seemingly esoteric debates aren't mere academic exercises. Scientific classifications can have legal and political ramifications. Currently, in Vermont, legally differentiating between cannabis, a drug crop, and hemp, a fiber crop, doesn't involve looking at the plant's DNA or even determining how the grower is using it. Rather, McHenry says, investigators simply measure the plant's concentration of tetrahydrocannabinol, or THC, the psychoactive agent that produces a high. If your plant shows a concentration of less than 0.3 percent THC, you're free to make hemp paper of the kind used to pen the Declaration of Independence. A concentration of more than 0.3 percent, and you could be facing a felony drug-cultivation charge. For McHenry, such distinctions raise legal and ethical concerns, especially for the more than 2,600 patients currently on Vermont's medical marijuana registry. The botanist also serves as executive director of the Vermont Patients Alliance, a state-licensed nonprofit medical cannabis dispensary and research facility in Montpelier. Her husband, Kalev Freeman, an assistant professor of surgery in the UVM College of Medicine — who's seated in the front of the classroom today — acts as the dispensary's medical adviser. As McHenry makes clear using onscreen charts and scatterplot diagrams, the absence of clear pharmacological standards in the U.S. cannabis industry makes it challenging to study, dispense and dose cannabis like other drugs. Medicinal strains such as Harlequin, Trainwreck and Jack Herer are sold in dispensaries and purchased by patients, ostensibly to address specific symptoms. Yet their mix of cannabinoids — the dozens of active compounds in cannabis that target receptors throughout the human body — can vary widely. Two speakers highlighted the same point during a guest lecture the preceding week, titled "The Economics and Business of Cannabis." Willy Cats-Baril is an associate professor in UVM's Grossman School of Business; Tripp Murray is a managing partner at Virentium Advisors in Burlington and works as a consultant to the cannabis industry around the country. Murray noted in that class session that consumers can walk into six different dispensaries in Colorado or California and buy strains that all bear the same name. Yet no two are likely to have the same potency or cannabinoid profile. 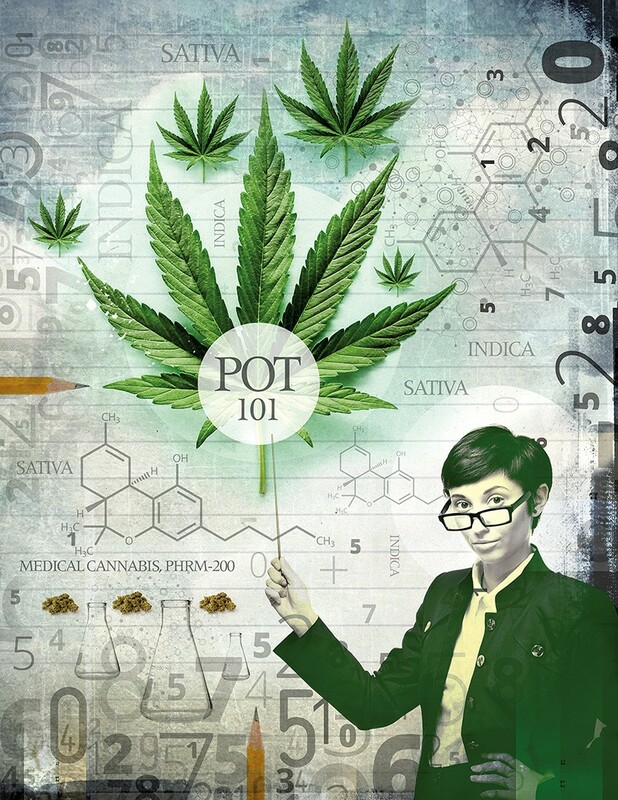 Students' interest in taking "Pot 101" — as some in the pharmacology department have dubbed it — was high from the get-go. All 100 slots filled up quickly during registration, most taken by undergraduates. Spaces were reserved for graduate and continuing education students, as well as for faculty interested in auditing the class. The fascination many college students have with cannabis is evident from the smattering of pot-leafed apparel in McHenry's classroom. And that, says Wolfgang Dostmann, is precisely why the pharmacology department decided to offer the course and use it to ignite students' curiosity about the discipline. Dostmann is one of three pharmacology professors, along with McHenry and Karen Lounsbury, who created and co-teach the course. It was a "head-slap moment," he said, when they realized they could entice students into their field via the study of a psychoactive drug with which many already have some familiarity, if not firsthand knowledge. "We want them to be engaged and turned on by physiology, biochemistry, pharmacology and biology. So we use cannabis as a magnifying glass," Dostmann explains during an interview with him and Lounsbury. "It's easy, because it's just that one product. It's not like med school, where they have to learn gazillions of antibiotics." Despite the abundance of anecdotal — and sometimes experiential — knowledge on display in this classroom, students and faculty alike still have much to learn. "We realized when the topic [of teaching the course] came up, we didn't really know that much about [cannabis] ourselves," says Lounsbury, who also teaches courses on opioids, pain relief and drug abuse. "There was never any talk about it in my pharmacology classes. We didn't even know how much was known about it." Marijuana's federal classification as a Schedule I drug, described as having "no currently accepted medical use and a high potential for abuse," effectively shut down all U.S. research funding from the usual sources, such as the National Institutes of Health and the National Science Foundation. Yet events have made that research imperative: Twenty-three states, including Vermont, and the District of Columbia have now legalized cannabis use for medicinal purposes. Last year, UVM's College of Medicine finally decided that if doctors are going to be recommending it to patients, it's high time to start teaching it like any other medicine. "This was daunting and really intense. We've had to cut through a lot of the gravy," Dostmann says, referring to dubious research. "Anyone can put anything on the web. That doesn't mean anything." Another goal of the course is to help lift the stigma attached to cannabis, yet students themselves offer evidence of its persistence. Some express wariness of being quoted in the press, fearing it could jeopardize their future career prospects. One student notes privately, in reference to taking the class, "I don't know if my dad would be cool with it." A junior studying biological sciences, who agrees to talk on condition of anonymity, says he was surprised to learn that cannabis provides patients with more than just relief from pain and nausea. It also has cardiovascular benefits and affects the endocrine system as a hormone regulator. Before taking the class, the student says, he assumed it would teach him "things you've heard whispers about, but just in more depth. But this has been much more holistic." One of the more experienced "students" in the room is Joseph McSherry, a UVM associate professor of neurological sciences, who began his medical training in the early 1970s. McSherry points out that, until 2010, neurology textbooks didn't even acknowledge the existence of the human body's endocannabinoid system — what he calls the "kick-back-and-heal system." That's quite an oversight, since that system, composed of receptors throughout the body, helps mediate appetite, pain, mood and memory, as well as the effects of consuming cannabis itself. McSherry, who first testified before the Vermont legislature on the potential effects of cannabis legalization in the late '70s, says this class could go a long way toward clearing away the haze of bad science surrounding what he calls "a miracle drug." Some of that bad science, he adds, shows up in the 70-page "Health Impact Assessment" on marijuana legalization that the Vermont Department of Health issued to lawmakers in January. That report — which, McSherry notes, was written by a committee that didn't agree with all its conclusions — included only the negative health effects of cannabis legalization. In his view, it reads more like the agenda-driven "rubbish put out by SAM" [Smart Approaches to Marijuana, an anti-legalization group]. McSherry, who can cite from memory the pages and paragraphs of the report he agrees with, calls the rest of it "a waste of taxpayers' money." Most other faculty members involved with the medical cannabis class have avoided commenting on the politics of Vermont's legalization movement. Still, it's not hard to read between the lines of their remarks and conclude that they see legalization as inevitable, in Vermont and elsewhere. Both Lounsbury and Dostmann, who testified before the legislature on the potential health impacts of legalization, make the point that a legalized adult-use market would benefit Vermont's medical cannabis dispensaries by dramatically increasing the number of strains available to patients. (Currently, dispensaries cannot import strains from other states as they need them.) In his testimony, Dostmann called on the legislature to devote state funding to research. Last year, McHenry, Freeman, Cats-Baril and several others announced the formation of the PhytoScience Institute. Its goal, Cats-Baril explains, is to turn Vermont into a "center for excellence" in cannabis research. "We shouldn't try to be in the business of major production and [opening] huge numbers of outlets," he says about Vermont's current legal wrangling over the form legalization should take. In fact, Cats-Baril suggests, it would be a mistake for Vermont to pursue adult-use legalization simply as a way to drive tourism. Our recreational pot market would dry up as soon as New York, Maine, New Hampshire or Massachusetts legalizes, which he also sees as inevitable. Economies of scale and Vermont's higher energy costs, Cats-Baril adds, will preclude the state from competing with bigger ones in the realm of large-scale, commoditized cannabis production. Instead, he recommends that Vermont pursue high-quality, consistently reproducible and patentable strains that serve specific purposes. As Cats-Baril puts it, "People will come here to get treated, like people go to the Mayo Clinic." Freeman envisions immediate and direct applications in Vermont for such specialized medicinal strains — notably, in the treatment of opioid addiction. He points to research, released last month by the University of Michigan, that found medical cannabis users experienced a 64 percent reduction in opioid use compared with a control group. Getting to the point where the state could make a name for itself with such treatments, Freeman admits, would take time and a paradigm shift in public thinking. Only when the stigma has lifted will Vermont's scientific community be able to move beyond such debates as whether indica and sativa are one species or two. The original print version of this article was headlined "Budding Prospects"